condensing is a natural result of the felting properties on wool. Shrinkage takes place because the fibers are drawn together. As a result, the fabric has a "fuller" look, more compact body. is the process applied at various stages of felting. Usually, wet fiber is tentered. The primary purpose is to dry and even out the fabric width. A tenturing frame can be used. A blast of hot air quickly removes any moisture. A process called crabbing is used in finishing the wool felt. The process ensures that the fabric is stretched or loosened as nescessary and evens out the thickness of the fabric. Crabbing prevents the formation of creases or uneven shrinkage. is one of many possible finishing processes applied to wool fabric. This process sets up the nap and develops a luster. Wet decating material is wound tightly on a perforated iron roller and immersed through trough of hot water that forces the water through the fabric. Dry decating steam is used instead of water. is a raising process. The fabric is saturated with water, the fibers of moist wool raises and curls and then shrinks. When this is brushed out in one direction the fibers are smooth and lustrous, brushed the other direction the fibers can stand up and give a halo effect. Also, in England, cappers and hatters made hats and hurers made (caps) hurers are also a felted shaggy woolen cap with a felt finish. with those titles were suppose to perform that job. is an official who examined the quality of the wool and stamped them with the town's approval. cleaned and thickened the fabric by treading it underwater with fuller's earth. 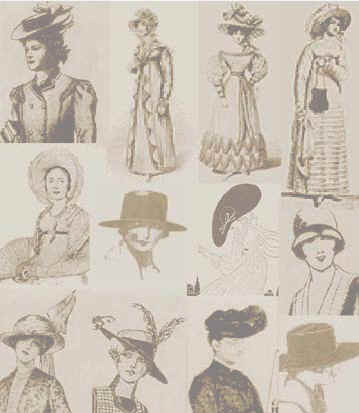 a person who made felt used in hat making. a weaver that made a special kind of woolen cloth. That was used for purposed other than clothing. Leuring lathe is a turntable with a block on it that supports a felt hat. The hats is placed on the block and the lathe is turned while a leurer "leures" it with a plush velveteen pad which gives the hat a shine to the crown felt fibers.